Human history, our earth history begins in all books with a monkey who had started to walk on 2 legs, then in millions of years learned to make weapons and fire, etc. This is all wrong ~ Genetics has proven that we, the Sapiens, the wise humans, appeared just around 50,000 years ago on the plains of Africa. We have to rewrite all our history. Clues of the truth of human history can be found in our genes, in the stars and in the great constructions of mankind. Science has failed us and for years has told us lies and illogical data; and our minds were kept in the dark. We are in 2014 and it is now the time to awaken. It is a scientific fact and a reality that we, because of the appearance of Homo Sapiens, have evolved faster and faster, and this evolution has brought us today to a highly advanced technological level. As I wrote in a previous article, even Science tell us that the Neanderthals were wiped out by the Homo Sapiens. Logic and Ancient Wisdom is telling us that we are, in fact, symbiotic children of the two. We are Sapiens/Neanderthals. We have the wisdom and the speaking abilities of the Sapiens, but also the animal instincts of the Neanderthals. This transformation, this combination of the two DNAs, is present in each and every human on earth. To find out a clear date of this transformation, of this unique, incredible, historical event, we can use the Mayan cycles of 5000 years and go back and calculate. Starting in the year 2012, if we take out the 5125 years per Mayan Cycle, we travel back in time to the year 3113 BC. In this year the change to the last cycle took place. Around this period 3200-3000 BC, archeologists discovered and dated several events that indicate indeed a leap of civilization all around the world. This leap took place after the Biblical Flood and the survival of Noah’s Ark dated by archeologists around 4000 BC ~ after the discoveries in the City of Ur Mesopotamia ~ made in 1923 by Leonard Woolley. In this period we find also one of the greatest moments of mankind ~ the Cultural Revolution. Around 3500 BC the Sumerians, and at 1600 km from the Sumerians, the Egyptians, invented writing almost at the same time. This changed humanity forever. They also invented the wheel and the plow, and agriculture made real progress. If we go back another Mayan Cycle from 3113 BC we find ourselves around the year 8000 BC period in which science dates the beginning of the Neolithic Revolution after an ice age. In this revolution in human societies all around the world suddenly appeared agriculture, metallurgy, geometry and other great constructions. The Mayan Cycles mark two disasters; the flood and an ice age, but also two of mankind’s greatest revolutions ~ evolution of the Sapiens/Neanderthals minds, and two of the greatest mysteries of how these evolutionary steps happened so fast and all around the world an the same time as if something generated a global change of our DNA activating some kind of the genes of knowledge and wisdom. Our ancestors have left us a clue that makes everything easier for us to learn about our origins: The Great Pyramid and The Sphinx in Egypt. For many years, scientists and people all around the world were puzzled because in front of a perfect pyramid with many mathematical and astronomical data, is a statue of an animal with a human head. For man this was not making any sense, and he thought that the Sphinx was not constructed during the same time period as the pyramid ~ and was just a Pharaoh’s addition to claim the pyramids. But science has proven that the Sphinx is as old as the Great Pyramid. So then, what is the Sphinx? The answer is that the Sphinx is a witness, a mark to the new Sapiens/Neanderthal race on the surface of the earth, a Tribute to all humans on the planet and a clue of what we really are ~ Symbiots. Our ancestors, the Sapiens have left clues all over the planet for us; and also have passed on from generation to generation Secret Knowledge and Spiritual Exercises that can be found in all religions in order for us to be healthy, wise and happy ~ to live long lives, to have blossoming, peaceful societies, and even live hundreds of years like the Biblical Noah. Even today scientists have confirmed the existence of an immortality gene inside of our DNA, and once activated we will age very slowly and live hundreds of years. This is a certain scientific fact. Regarding our Immortality Gene, CLICK HERE for information about Li Ching-Yuen, a Chinese Herbalist, Martial Artist, and Tactical Advisor, who was reputed to have lived for 256 years. The Sphinx and the Pyramids are, in fact, a spiritual exercise left for us to understand and practice. The Sphinx of Giza is oriented with the face to the sunrise. It was called by the Ancient Egyptians ~ Hamachis ~ the Sun Rising God. Later the name was changed to Hor-Em-Akhet. Akhet is an ancient Egyptian hieroglyph which represents two triangles united by a line which represent the sun at sunrise and at sunset. This hieroglyph describes what happens when you look at the 2 pyramids Keops and Kefren sitting on top of the sphinx in the summer solstice. This is a code in which our ancestors tell us how to harvest the good energies of the universe. Science tells us that the Pyramids and the river Nile matched exactly Orion’s belt in the year 10,000 BC. 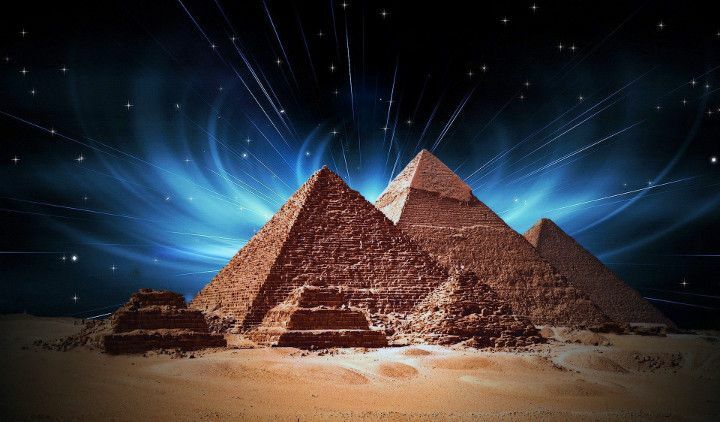 In this year it is certain that the pyramids existed and our ancestors Sapiens/Neanderthals, were using the spiritual exercises to harvest the good energies of the universe. The light that is coming from the three stars/suns of the Orion’s belt can be harvested using our own energy channels with the Zai Mudra. Search the night sky, find the 3 stars of Orion’s belt, and look at them through the Zai Mudra. This will allow the energy to flow into your inner universe. If we add to the year 10,000 B.C. of the certain pyramids-orion alignment the 2012 years to this day from the year Zero, we get 12,012. The Sumerians believed that the number 12 is the number of the Universe. We were at the perfect year in 12012, and we must wake up because this was the year of the changing of the transformation of the next evolution step. There is no end of the world, Only the Begining of our awakening and New Transformation of our DNA in the year 12012 -12.0.12.